What are symptoms and signs of neuroblastoma? What tests are used in the detection and diagnosis of neuroblastoma? What is the prognosis for neuroblastoma? What are the stages of neuroblastoma? What is the treatment for neuroblastoma? What are treatment options for neuroblastoma? Neuroblastoma is a disease in which cancer cells form in nerve tissue of the adrenal gland, neck, chest, or spinal cord. Neuroblastoma is the third most common childhood cancer after leukemias and cancer of the central nervous system. Common symptoms of neuroblastoma include a lump in the abdomen, neck, or chest; bulging eyes; dark circles around the eyes; bone pain; weakness or paralysis of a body part; and in infants -- swollen stomach and bluish lumps under the skin. To diagnose neuroblastoma, a doctor will take a history and perform a physical exam. They may also do a urine test, blood chemistry studies, X-rays, CT scans, neurological exams, ultrasound, and other tests, or take samples of bone marrow for analysis or biopsy. Many of these same tests can help determine the stage or extent of the neuroblastoma. The prognosis for neuroblastoma depends on the age of the child when diagnosed, the stage of the cancer, where the tumor is located, and how quickly the tumor cells are growing. There are four stages of neuroblastoma. Stages depend on whether the tumor can be completely removed surgically, if it has spread to lymph nodes or other parts of the body. For neuroblastoma, treatment is based on risk groups: low risk, intermediate risk, and high risk. The stage of neuroblastoma is one factor used to determine risk group. Other factors are the age of the child, the tumor's appearance under the microscope. its histology, and other measures of the tumor's biology. Standard treatment options include surgery, radiation therapy, chemotherapy, and watching and waiting to see how the disease progresses. Newer types of treatment include monoclonal antibody therapy, high-dose chemotherapy and radiation therapy with stem cell transplant, and other drug therapies. Taking part in clinical trials may be considered. Neuroblastoma most often begins during early childhood, usually in children younger than 5 years. It sometimes forms before birth but is usually found later, when the tumor begins to grow and cause symptoms. In rare cases, neuroblastoma may be found before birth by fetal ultrasound. Possible signs of neuroblastoma include bone pain and a lump in the abdomen, neck, or chest. Swollen stomach and trouble breathing in infants. Painless, bluish lumps under the skin in infants. Petechiae (flat, pinpoint, dark spots under the skin caused by bleeding). Swelling of the legs, ankles, feet, or scrotum. Twenty-four-hour urine test: A test in which urine is collected for 24 hours to measure the amounts of certain substances. An unusual (higher or lower than normal) amount of a substance can be a sign of disease in the organ or tissue that makes it. A higher than normal amount of the substances homovanillic acid (HMA) and vanillyl mandelic acid (VMA) may be a sign of neuroblastoma. Blood chemistry studies: A procedure in which a blood sample is checked to measure the amounts of certain substances released into the blood by organs and tissues in the body. An unusual (higher or lower than normal) amount of a substance can be a sign of disease in the organ or tissue that makes it. A higher than normal amount of the hormones dopamine and norepinephrine may be a sign of neuroblastoma. Bone marrow aspiration and biopsy: The removal of a small piece of bone, bone marrow, and blood by inserting a needle into the hipbone or breastbone. A pathologist views both the bone and the bone marrow samples under a microscope to look for signs of cancer. Biopsy: The removal of cells or tissues so they can be viewed under a microscope by a pathologist to check for signs of cancer. Immunohistochemistry study: A procedure in which dyes or enzymes are added to a blood or bone marrow sample to test for certain antigens (proteins that stimulate the body's immune response). The patterns of the tumor cells. How different the tumor cells are from normal cells. How fast the tumor cells are growing. The number of chromosomes in the tumor cells. How many copies of the N-myc gene there are. The tumor biology is said to be favorable or unfavorable, depending on these factors. A favorable tumor biology means there is a better chance of recovery. Bone marrow aspiration and biopsy: The removal of a small piece of bone, bone marrow, and blood by inserting a needle into the hipbone or breastbone. A pathologist views both the bone and bone marrow samples under a microscope to look for signs of cancer. Incisional biopsy or core biopsy: The removal of part of a lymph node using a wide needle. Needle biopsy or fine-needle aspiration: The removal of a sample of tissue or fluid from a lymph node using a thin needle. X-rays of the chest, bones, and abdomen: An x-ray is a type of energy beam that can go through the body and onto film, making a picture of areas inside the body. Radionuclide scan: A procedure to find areas in the body where cells, such as cancer cells, are dividing rapidly. A very small amount of radioactive material is swallowed or injected into a vein and travels through the bloodstream. The radioactive material collects in the bones or other tissues and is detected by a radiation-measuring device. These tests include bone scans, PET and MIBG scans. Stage 2 is divided into stage 2A and 2B. Stage 4 is divided into stage 4 and stage 4S. In stage 4, the tumor has spread to distant lymph nodes, the skin, or other parts of the body. cancer cells may be found in the lymph nodes near the primary tumor. There are 3 risk groups: low risk, intermediate risk, and high risk. High-risk neuroblastoma may be difficult to cure. Progressive neuroblastoma is cancer that has progressed (continued to grow) during treatment. Recurrent neuroblastoma is cancer that has recurred (come back) after it has been treated. The cancer may come back in the same place or in other parts of the body. Because cancer in children is rare, taking part in a clinical trial should be considered. Clinical trials are taking place in many parts of the country. Information about ongoing clinical trials is available from the NCI Web site 2. Choosing the most appropriate cancer treatment is a decision that ideally involves the patient, family, and health care team. Children with neuroblastoma should always have their treatment planned by a team of doctors with expertise in treating childhood cancer. Children who are treated for neuroblastoma may be at higher risk for second cancers. Some cancer treatments cause side effects that continue or appear years after cancer treatment has ended. These are called late effects. Late effects of cancer treatment include physical problems; changes in mood, feelings, actions, thinking, learning, or memory; and second cancers. Some late effects may be treated or controlled. It is important that parents of children who are treated for neuroblastoma talk with their doctors about the possible late effects caused by some treatments. Surgery is usually used to treat neuroblastoma. Depending on where the tumor is and whether it has spread, as much of the tumor as possible will be removed. If the tumor cannot be removed, a biopsy may be done instead. Chemotherapy is a cancer treatment that uses drugs to stop the growth of cancer cells, either by killing the cells or by stopping them from dividing. When chemotherapy is taken by mouth or injected into a vein or muscle, the drugs enter the bloodstream and can reach cancer cells throughout the body (systemic chemotherapy). When chemotherapy is placed directly into the spinal fluid, an organ, or a body cavity such as the abdomen, the drugs mainly affect cancer cells in those areas (regional chemotherapy). The way the chemotherapy is given depends on the type and stage of the cancer being treated. Monoclonal antibody therapy is a cancer treatment that uses antibodies made in the laboratory, from a single type of immune system cell. These antibodies can identify substances on cancer cells or normal substances that may help cancer cells grow. The antibodies attach to the substances and kill the cancer cells, block their growth, or keep them from spreading. Monoclonal antibodies are given by infusion. They may be used alone or to deliver drugs, toxins, or radioactive material directly to cancer cells. High-dose chemotherapy and radiation therapy with stem cell transplant is a way of giving high doses of chemotherapy and radiation therapy and replacing blood -forming cells destroyed by the cancer treatment. Stem cells (immature blood cells) are removed from the blood or bone marrow of the patient or a donor and are frozen and stored. After the chemotherapy and radiation therapy are completed, the stored stem cells are thawed and given back to the patient through an infusion, just like a blood transfusion. These reinfused stem cells migrate to the bone marrow and grow into (and restore) the body's bone marrow so it can again make blood cells. 13-cis retinoic acid is a vitamin -like drug that slows the cancer's ability to make more cancer cells and changes how these cells look and act. Surgery followed by watchful waiting. Watchful waiting alone for certain infants. Surgery followed by chemotherapy, when less than half of the tumor is removed or when serious symptoms cannot be relieved by surgery. Radiation therapy to treat tumors that are causing serious problems and do not respond quickly to chemotherapy. Chemotherapy followed by surgery and/or radiation therapy. High-dose chemotherapy followed by surgery to remove as much of the tumor as possible. Radiation therapy to the tumor site and, if needed, to other parts of the body with cancer. Chemotherapy followed by 13-cis retinoic acid. A clinical trial of monoclonal antibody therapy after chemotherapy. A clinical trial of radiation therapy with radioactive iodine before stem cell transplant. A clinical trial of stem cell transplant followed by 13-cis retinoic acid. Surgery followed by watchful waiting or chemotherapy. High-dose chemotherapy, stem cell transplant, and 13-cis retinoic acid. For recurrent neuroblastoma that is found in one place in the body, treatment is usually surgery, with or without chemotherapy. For recurrent neuroblastoma that has spread to other parts of the body, treatment is usually high-dose chemotherapy, stem cell transplant, and 13-cis retinoic acid. A clinical trial of chemotherapy followed by monoclonal antibody therapy. A clinical trial of radiation therapy with radioactive iodine, alone or before stem cell transplant. A clinical trial of stem cell transplant. What were the signs and symptoms associated with your or your child's neuroblastoma? Describe the tests and exams that led to a diagnosis of neuroblastoma. What kinds of treatment did you or your child receive for neuroblastoma? Cancer fatigue is a lack of energy that is caused by cancer or cancer treatment, including chemotherapy, radiation, biological therapy, or bone marrow transplantation. Strategies to combat cancer fatigue include scheduling rest, pacing oneself, planning ahead and prioritizing work and activities, eating the right foods, exercising, and practicing proper body mechanics. 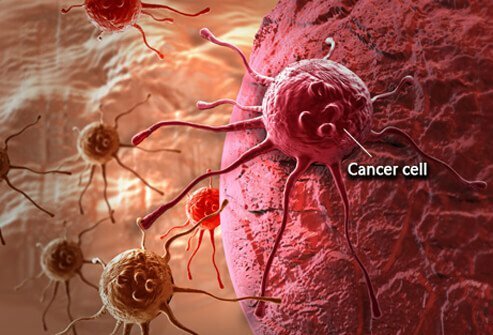 Cancer pain results from the tumor pressing on nerves or invading bones or organs. Cancer treatments like chemotherapy, radiation, or surgery can also cause pain. Over-the-counter pain relievers, prescription medications, radiation, biofeedback, and relaxation techniques are just some treatments for cancer pain. Syndrome of inappropriate antidiuretic hormone (SIADH) is common in older individuals and happens when too much antidiuretic hormone releases and causes water retention and a low sodium level. There are several causes of SIADH. Symptoms include seizures, irritability, elevated systolic blood pressure, and hyponatremia, among others. Treatment involves restricting fluids, treating the underlying cause, and taking medications to decrease the antidiuretic hormone's effect on the kidneys.